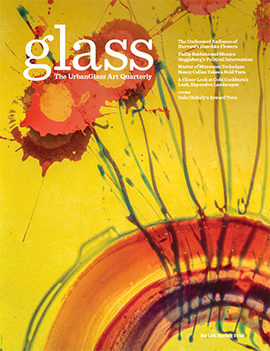 Glass Quarterly Hot Sheet: Can you tell me a bit about how the exhibition came to be, what inspired it? Megan Biddle: I think about using materials as communicating in different languages. Being embedded in a community of artists who have a deep understanding of glass emphasizes this. In our conversations there is a comprehension of the material, the different processes used to manipulate glass become dialects within the language. I am aware of this when teaching beginning students as there is a new vocabulary for them to learn. 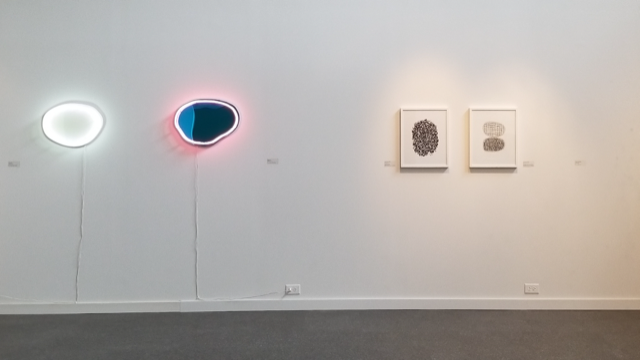 Glass: How does the title, "Fluid States," reflect the curatorial premise of the exhibition? Biddle: The title for the show is "Solid States Fluid Language". It refers to the characteristics that glass exhibits at different temperatures from molten to a rigid solid and everything in between. Within those ranges is a complex medium with an ability to express a spectrum of subtle and dynamic notions. Glass: How were the six artists chosen -- and how do you see each of them fitting the exhibition theme? Biddle: For the show I was asked to feature “regional” artists who work with glass, so I invited near and dear. 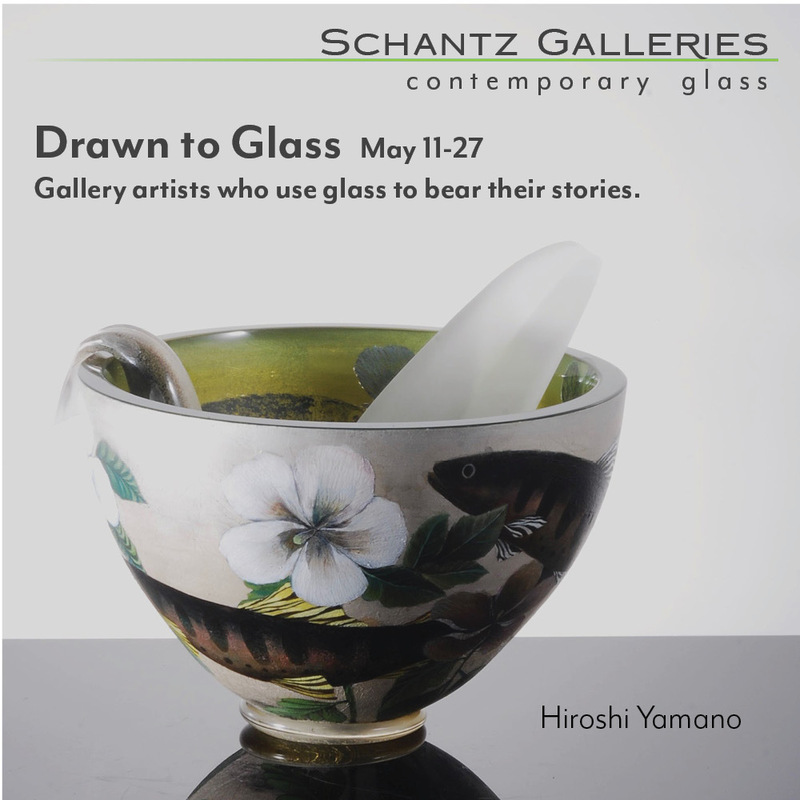 I chose them because I admire their work and their process and thought they dynamically explored the idea of glass as a language. I like to think about how these 6 artists communicate through the past, present and future. One of our oldest methods of communication were clay tablets inscribed with text in prehistoric Mesopotamia. These texts recorded events happening during this time and took the form of myths, hymns, proverbs and law. Reminiscent of these, Kristen’s tablets contain images that explore an 18th-century conception of Atopia or uninhabitable spaces. Amy’s collection of objects is like a nomadic library. She pulls from the traditions of pipe making, mold blowing, scientific glass and bead making celebrating the complex techniques that the torch has to offer. Each piece holds a story, a memory, a lesson that is re-told in a different context each time the piece is created. In our modern world, neon signs deliver direct information to us. Esther uses this palpable medium to communicate the subtle and fleeting quality of the landscape around us. 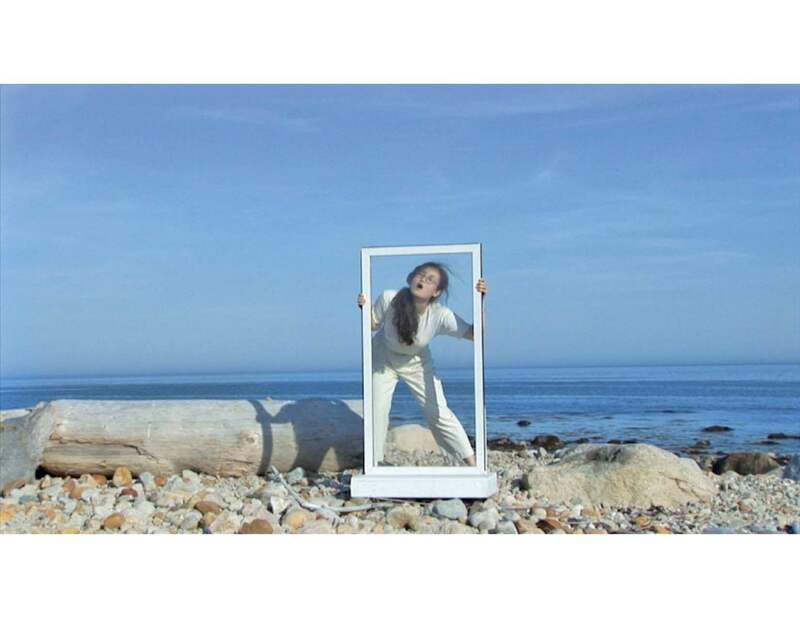 Pan uses a glass window pane to explore different interpretations of language. The glass becomes a visible but transparent barrier to which different levels of understanding is filtered through. Copper was once used to connect us through telephone cables, an advancement that changed the way we communicate. 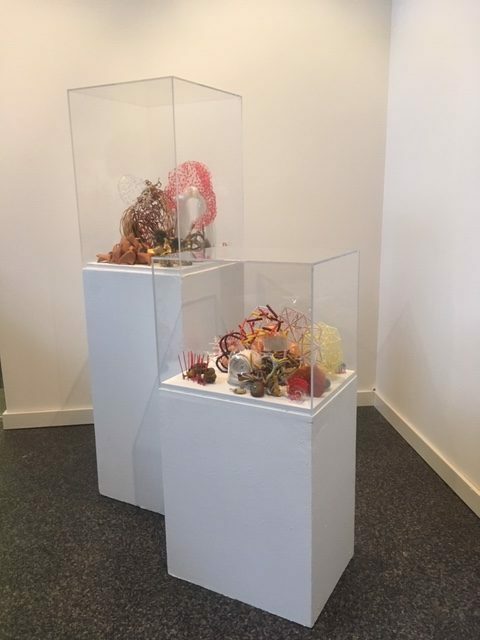 In her installation Jessica uses copper wire connected with bits of glass, forming a delicate net of chaos. It makes me think of how overly connected we are with technology so rapidly advancing. Her drawings use press type lettering, reconfiguring recognizable letters into shapes, giving the alphabet new meaning. Using found materials and handmade glass, Nate develops finely crafted instruments and devices that suggest the receiving and transmission of data. In his video, I imagine the static detected signals other forms of life. Glass: Is there anything else you feel is important to note to understanding this exhibition? Biddle: We had planned an artist panel and a performance by Pan for the opening reception on September 26th, but it was unfortunately cancelled with the campus at Bucks County Community college shut down that day due to a threat that was investigated by police. We rescheduled the performance and opening reception on October 10th.